A common requirement (and form of survival mode) in workplaces today is the capacity to do several things at once. Multi-tasking seems like a good idea for increasing productivity and using more of our brain’s impressive resources and, right now, you may well be scanning a Twitter stream while reading chunks of this blog entry and checking your text messages. Psychologists, though, now challenge the multi-tasking myth and even suggest we slow down and do one thing at a time. Let’s take a look at multi-tasking from your brain’s point of view. Simply, the human brain cannot concentrate on more than one thing at a time and focusing on one task is less tiring than not concentrating entirely on several. In addition, the brain takes time to switch between tasks (goal shifting) and then start the next task (role activation) and it’s estimated that multi-tasking can reduce productivity by up to 40 per cent. Besides feeling tired and becoming slower at work, multi-tasking can invite errors such as hitting the ‘reply all’ option when sending an e-mail or even causing accidents while driving because of lack of concentration. The best (and possibly only) alternative to multi-tasking is single-tasking. It’s a tough change for most of us because we have adapted to the sense of activity gained from flitting between different activities. Novelty captures our attention and it is difficult to ignore new stimuli when it causes small hits of feel-good hormone dopamine to be released into our brains. Practice the art of concentration and re-learn an appreciation for the focus that concentration can bring. Block out distractions for small periods of time and build up as you progress. Try a formal method such as the Pomodoro Technique which sets regular work and break times. If you want to practice this type of exercise without the temptation of checking an app on your smart phone, you can try the Tomato Timer web site for free. Take regular breaks and have a short walk outdoors without checking your watch and phone. Skipping lunch doesn’t aid afternoon productivity and even a short break can be beneficial. Vary the standard of your work so the important projects are excellent and the unimportant tasks are rushed. Keep computer programs closed when you are not using them and schedule when you check your email and social media accounts. This is probably the hardest habit to change but ignoring e-mails for even an hour at a time can greatly increase concentration. Avoid distractions in your workspace such as a cluttered desk and multiple monitors and be tough in meetings that go off-track. Schedule your day in advance and complete the hardest tasks in the morning. Giving up the multi-tasking habit can take weeks and you could experience withdrawal symptoms from the feeling of being (unproductively) busy and the little dopamine hits. The rewards though are increased productivity, mental clarity and an improved work/life balance. 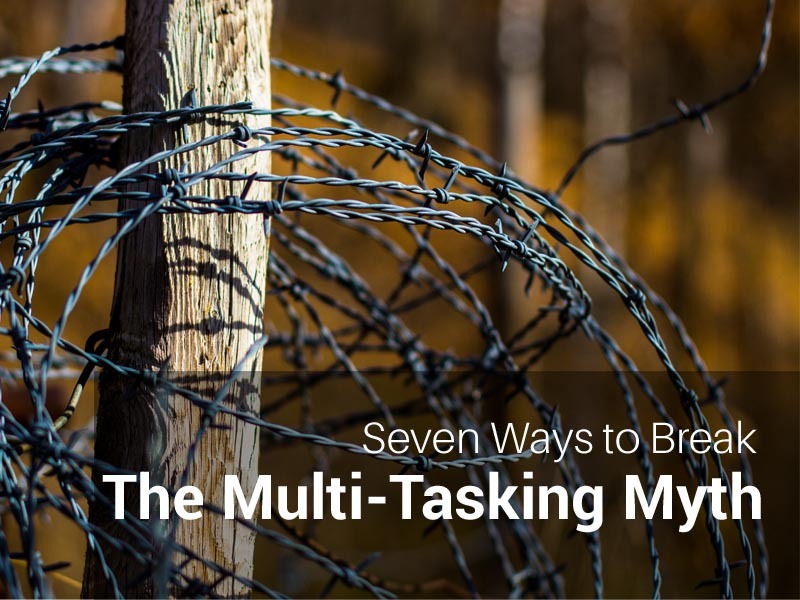 Have you broken the multi-tasking habit? What helped you succeed?